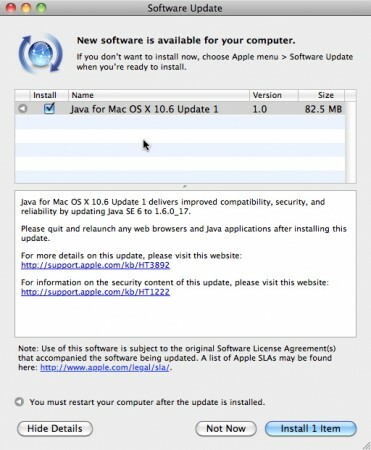 Apple has released 2 updates for Java: Snow Leopard (Java for Mac OS X 10.6 Update 1) and Leopard (Java for Mac OS X 10.5 Update 6). 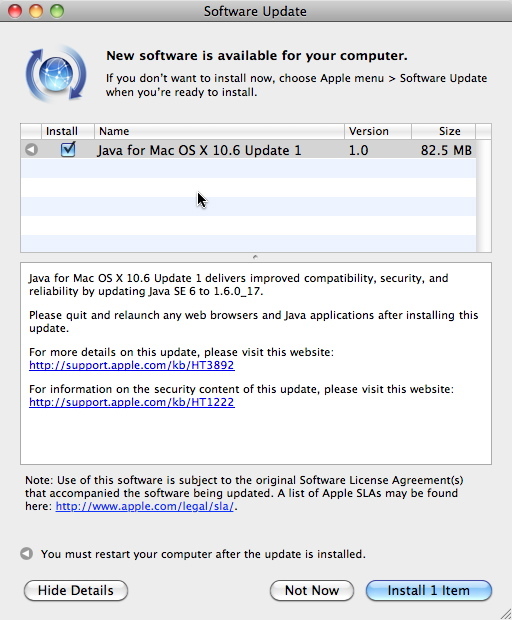 Both update Java SE 6 to version 1.6.0_17 and “delivers improved compatibility, security, and reliability”. A security update is included in this patch. Fixing multiple Java vulnerabilities ( read more: Snow Leopard and Leopard security notes). Vulnerability could lead to arbitrary code execution. So it’s important to install this update as soon as possible. The update is 85MB for Snow Leopard and 123MB for Leopard. It’s available from the software update utility or Apple’s site.